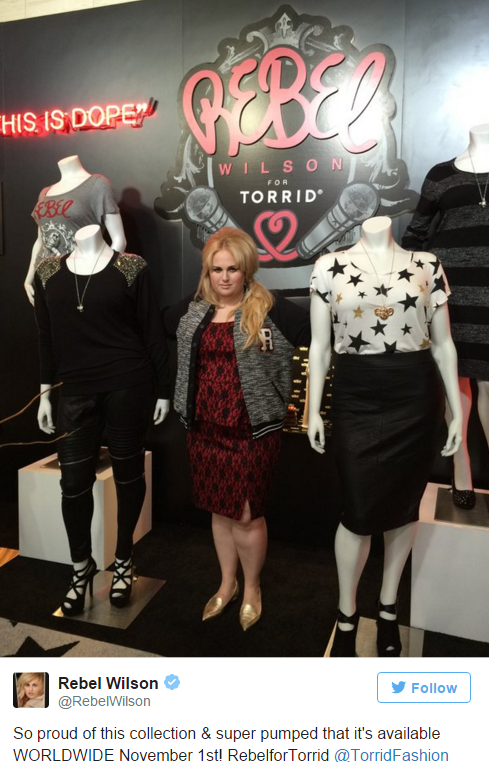 Last night in Hollywood, actress and comedian Rebel Wilson unveiled her much-anticipated fashion collection, REBEL FOR TORRID. The limited-edition collection is a collaboration with TORRID, the fastest growing plus size fashion brand. The pavilion of MILK provided the backdrop for Rebel to personally introduce the collection. A REBEL FOR TORRID pop-up shop stood center stage, capturing the essence of the collection and her personality. Mannequins dressed in key outfits from the collection filled the space. Individual pieces were displayed on vintage racks. The back wall of the shop highlighted iconic elements from Rebel’s designs: microphone, koala and lion crest graphics. The collection’s theme, ‘Welcome to the Rebelution,’ was illuminated in neon. The REBEL FOR TORRID logo lit up the entire space. Rebel invited guests inside for interviews and a closer look. Prints and patterns from the collection were borrowed for decorative accents—from the star carpet to throw pillows. Trays of jewelry were laid out on tables and shadowboxes spotlighted the accessories. Friends, family and press were thrilled to preview the collection with the designer and interact with the brand at the same time. REBEL FOR TORRID will be sold exclusively in Torrid stores in the U.S. and Canada, and online at Torrid.com starting the first week of November 2015. The limited-edition collection features approximately 25 pieces including tops, bottoms, jackets and dresses, plus accessories, ranging in price from $22.50–$98.50. A spring 2016 collection is in the works as well.